I can honestly find nothing but good things to say about this detector. I hope that it never comes to it, but if it did, I suspect this would be the one I held on to, if the others had to go. One of the best tesoro's. I have three Tesoro Metal Detectors. This is my best. Very stable. Good depth. However, you can get better depth if you upgrade the coil. Simple ground balancing without turning knobs. It is a 17.5 kHz machine so it will find small gold. One of the best features is the "Auto Ground Tracking." I have never liked manual ground balancing. Soil changes and it can change within a foot or two. Then you loose depth or the machine becomes unstable. This is why the Lobo is so stable. It tracks the soil changes in the ground. I like having my controls on top. But, one reason the Lobo is designed the way it is, because you can remove the receiver and place it on your belt. Very nice for those long beach hunts. I've had my Lobo for about 8 - 10 years. The battery compartment clips finally broke. They sent me new ones at no charge. My other 10 - 12 year Tesoro's speaker stopped working. They fixed it. No charge. How good is that! You really can't go wrong with a Tesoro Lobo. And, you cannot go wrong with the Tesoro lifetime warranty. I cannot see purchasing a $500 - $1,000 metal detector and only getting a 1 - 5 year warranty. Does not make any sense. Over the years I have spent some serious money on top of the range detectors. However I am still yet to find a detector that comes close to the performance of my Lobo when it comes to small finds. I search a lot of Roman sites and always come away happy with plenty of small coins found at depth. Excellent on silver and Gold items. I must say I enjoyed using my Tesoro LSQ. Found it very loud at first but I put tape over the speaker and it was good. It has been coin magnet, finding the smallest of Newfoundland coins: the 5 cent piece. Within the two months of using it I found many coins big and small, modern and old, and tons of relics as well. As a machine with no Target ID or a screen for that matter, you would know you got something not iron just by the sound the machine made when it was in discrimination mode. Also, the machine was fantastic at finding coins over larger items as well. I was even surprised by the depth when the machine was in All Metal Mode with the stock coil(the depth in discrimination mode was pretty decent too). However, After a fair amount of use within two months after receiving my Tesoro LSQ( I bought it used but seller said it was used just once)I noticed the All-Metal to Discrimination switch was starting to not work because it would stay All metal. So, I kept it on discrimination mode when the machine decided to switch to it. But sometimes I would accidentally hit it while detecting and it would be stuck in All-Metal again. Every time it would be in All-Metal mode, the longer it would stay in it. Now, it would not go back no matter how much I flick the switch. That being said, the machine still works perfect and was a fine machine when it was fit enough to find the "interesting stuff". If I had the money I would buy another one, but I'm not a big fan of knobs any more. This VLF machine is awesome! It is super sensitive on small gold and works great on coins and relics. The auto ground balance works as described and makes working with hot rocks a breeze. After several months of detecting I had an internal circuit fail one day. I sent it back to the factory where it was fixed, re-calibrated and sent back to me within a couple weeks free of charge. They stand behind their warranty--thanks, Tesoro! If you want a good gold machine at a good value, you won't be sorry choosing this machine. 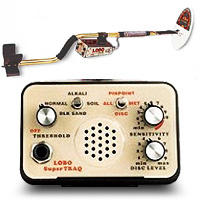 I bought the Tesoro Lobo Supertraq in a prospecting shop in east Mesa some years ago after walking into the store to price the high bankers. I noticed several used detectors for sale but noticed one that was on display as a new arrival. After talking with the nice folks in the shop I was offered a demonstration on how the Supertraq performed. Just as described in early comments, these guys had a bucket of sand with a hole at the bottom. They had several different wood steaks with several different metals, copper, silver, gold etc.. . They showed how to balance the device by using the up and down method and then detecting the metals. To my amazement I was impressed and sold on the spot. The other seller was the company was out of Prescott not far from home so if I had any issues I could take a nice scenic trip over there to have them look at it if I had any issues. It had been at least a year with no issues until I loaned it to my father while he took his monthly trip to Rocky Point. No! Not a mechanical issue, a darn theft issue. Some one broke into his under storage of his 5th wheel down near Playa Del Oro. Sad to say it took me almost three years for my wife to allow me to buy another one. I have had some awesome finds around the Payson area ranging from buffalo nickles, Un Pesos, Wheat Pennies, Broadheads, parts from guns, a copper nugget, and the weirdest thing was a pet burial. Yes, a dead pet buried in its bed with the collar and bell still around the neck out in the forest. No gold yet though and I haven't used the discrimination that much because I am in search of that nugget, but I don't mind digging everything up because you never know what you might miss. The depth detection is amazing to other detectors I have used and they say the rule of thumb to detectors is or was that per every hundred dollars you spend on one, that is how many inches you'll get, $500 being 5 inches. Well, I believe the Tesoro exceeds that. I highly recommend this device as it is pretty easy to use and give it an overall 5/5. Nice work Tesoro! I'm new to detecting, but not prospecting. I did research on this detector before I bought it and made the right decision! it finds everything. I read the manual from front to back and took it out to an old mining site. The first day I found lots of old square nails, lead bullets and tiny lead shot the size of a bb. My second day I went to the same site and after a couple hours of finding trash I got what I was looking for, a 5.54 gram gold nugget!!! Good coinshooter - not so great for prospecting. Had LST for about a month and took out prospecting on 6 occasions. Good depth - found a penny at 10 to 12". Couldn't stand constant change in threshold over mineralized ground. Will not detect nuggets much less than a gram. Returned to dealer and bought White's GMT. Much more stable and will detect down to 1 grain or smaller. Can use to locate pockets of fine gold. Bob M. from Mesa, AZ. My neighbor has a TL and he loves it. Found a paper clip 12" deep. He really thought he had something. We laugh at him and tell him he did. He did find a copper nuggett up on Rich Hill that the guy at a local rock shop offered him $800 for. He didn't sell it. We also went the gold show in Mesa a few weeks ago and they were demonstrating the Lobo finding a gold nugget about 10 of soil. Had a 5 gallon bucket with a piece of pvc running thru the bottom of it with dirt piled on top. The guy was running a stick with a piece of gold through the tube and the detector picked it up. That sold me. . . so that is my next detector. Just got back from a school the lobo pick up lot of junk had it in discrimination around 4 or 5 to stop iron and foil. Now I got to get to know it like I do the scorpion which can pick you coins rings when ground balance right, vaquero easier to use then the scorpion, cx plus with the treasure hound attachment. Next week learn more on lobo.